For over two decades Mary Hart Taylor directed the health clinic and various core health programs at Neighborhood House. She was well liked and respected by the community. It was a well-known fact in Logan Heights that if your child became ill in the middle of the night, you knocked on Miss Taylor’s door and you would be allowed in or she would follow you to your home to administer medical advice and care. One of reasons that Neighborhood House was established was to address the high mortality rate of Mexican children in Logan Heights. Its programs carried out two specific recommendations from the College Women’s Club (CWC) findings in their 1914 Pathfinder Social Survey of San Diego in 1914. Kyle E Ciani provides extensive insight into this topic in Revelations of a Reformer: Helen D. Marston Beardsley and Progressive Social Activism. Mary Hart Taylor RN was a public health nurse at the time in charge of the city’s child hygiene division, supervised visiting nurses in providing medical examinations for babies, distributing pure milk to families and teaching hygiene classes to mothers and daughters. Miss Taylor carried out these duties as the director of the Neighborhood House clinic. Medication was provided by the San Diego Health Department. The doctors were volunteers, becoming a model that would be followed fifty years later when the Chicano Clinic was opened. There was also a dental clinic although it did not operate on a daily basis. All of these services were free. In many of the news articles of that period the Neighborhood House clinic is recognized for lowering the infant mortality rate as intended. Babies were delivered, illnesses were diagnosed, and tonsillectomies were performed at Neighborhood House. The waiting room was the hallway, with the auditorium being set up as various examination rooms. At times the auditorium was used to perform tonsillectomies. Several of the individuals I interviewed for my 1974 research paper remembered that at times the kitchen was used for minor surgeries. In today’s litigious world, no one would consider using the kitchen table for any medical procedure. However in those days the need for medical services and practicality were over-riding factors. His mother- in- law, Mrs. Serrano, who lived across the street from Neighborhood House in the 20’s and 30’s, had the responsibility of taking the bed sheets from the clinic and washing them. It seems this was a job for which she was compensated, however it is unclear is if she received direct or in-kind compensation for her work. The Great Escape Miss Taylor followed a daily regimen of administering one tablespoon of castor oil. This prompted what Dickie Negrete referred to as The Great Escape. He explained that the tablespoon of castor oil was followed with a slice of orange. His exact words were “I hated it.” On the other hand another Neighborhood House kid Bob Vasquez says he didn’t mind the castor oil. 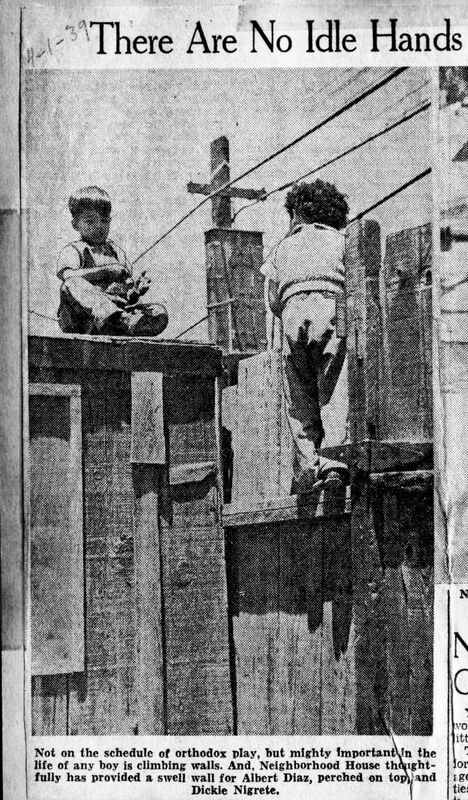 But on this particular day, captured in the photograph at left, Dickie and Albert Diaz had decided they would not drink the castor oil and were actually trying to climb over the fence and go home. According to the articles there was a Mexican dinner served and the event had about sixty people in attendance. I am sure some of those in attendance were the Mexican women from the community however I have not been able to document who they may have been. I also believe that some of those in attendance were either Neighborhood House board members or some of the women that also attended the fund raisers held for Neighborhood House. 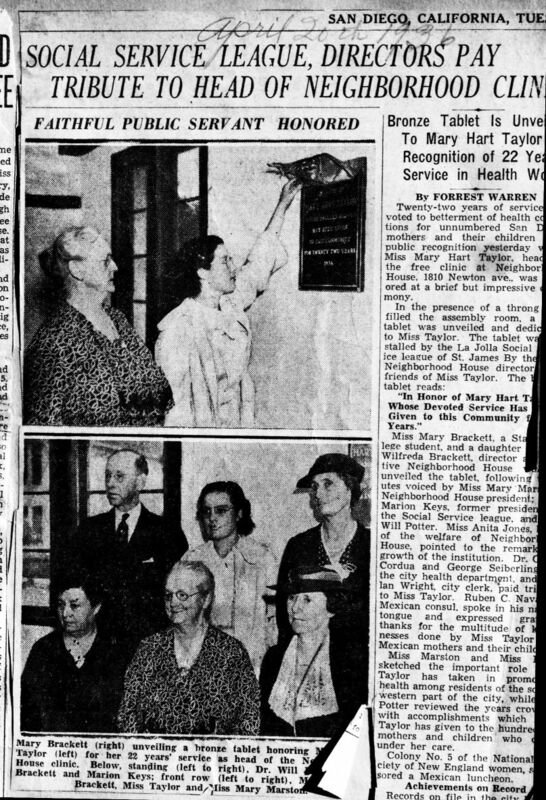 Miss Taylor’s departure from Neighborhood House in 1938 brought a great deal of recognition for the many contributions she had made to the medical needs of the Logan Heights community. Of course the celebration involved many of the kids from Neighborhood House. The program was held in the auditorium to a packed house. The community not only knew her as a health care provider but as a true friend. Her recognition celebration was unique in that dancers from both sides of border performed. Of course special permission had to be obtained to allow the Mexican dancers to cross the border. The fact that such an effort was put forth to involve Mexicans from Mexico tells you that the line dividing both countries was not as defined as it is today, as well as how highly her contributions and work were held in both communities. The Vice Consul from Mexico gave her a gold medal with the inscription “Mary H. Taylor in appreciation of faithful service 1914-1936. “ The money for the gold medal came from many of the mothers in the community who had benefited from her support when raising their children. 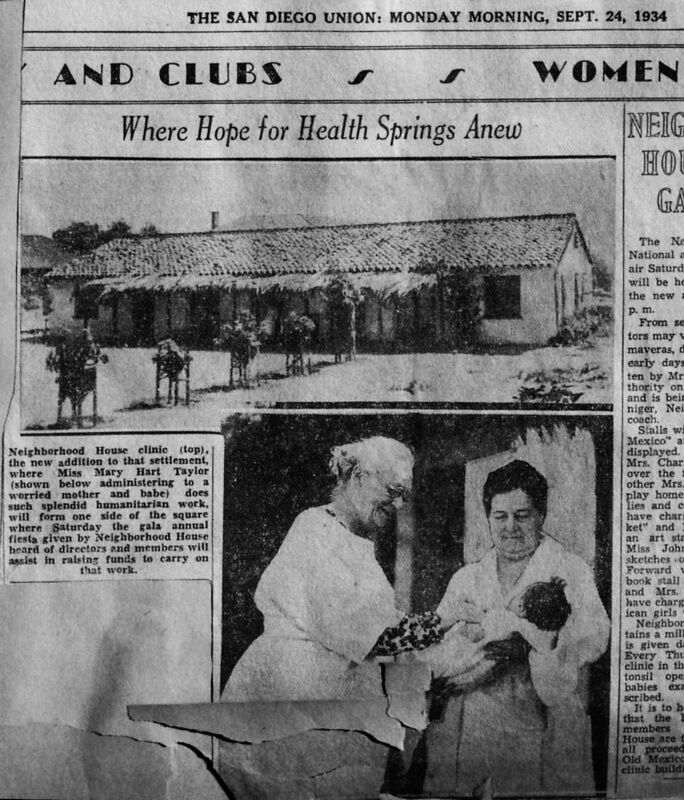 The Well Baby Clinic, the immunizations, and many other services had come from the work Miss Taylor had done. The community devotion to Miss Taylor was evident not only in the gifts she received but in many testimonials from the mothers and their children. The goodbye celebration included gifts from the board of director and from many of the people that had given financial support to Neighborhood House. The San Diego Union reported that the American Friends Service Committee gave her a leather traveling bag while the neighborhood children provided more personal and touching expressions of gratitude to their beloved Miss Taylor– bouquets of flowers that they had all gathered for this occasion, crafts and handmade gifts. Mothers from East San Diego presented her with a gold pen. Mexican Vice Consul Carlos de La Sierra presented her with a picture which bore a loving inscription and was a wreath of pink roses in water color. Another bouquet was presented by Little Lupe, a familiar figure at Neighborhood House, where she was known as Lupita. She only reached to the tall supervisor’s waistline but was allowed to pin her small white flowers to Miss Taylor’s belt. Lupita will have her own article at a later date. Although Miss Taylor was leaving the clinic she was not leaving her work as a public health nurse nor was she leaving San Diego. Memories of the Neighborhood House clinic, its services and the distinctive presence of Miss Taylor have been recalled time and again by the many people I have interviewed. 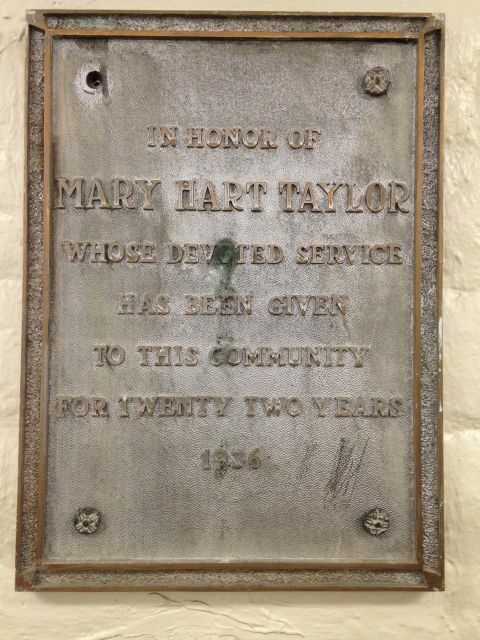 Mary Hart Taylor and the history of Neighborhood House are securely intertwined. Thanks for writing these articles, as I am really enjoying them. Cheers. Michael thank you for your comment. I am enjoying interviewing the many people that have shared their story. Terrific article, Maria. I feel like I was there and it’s so interesting to see that work that started back then still continues. Truly enjoying your work…Adelante!